The GW Medical Faculty Associates Mobile Mammography Program makes early detection of breast cancer readily available to the women of the Washington, D.C. metropolitan area. Dedicated to providing women with education and support, this self-contained mobile unit travels to corporate and community sites offering one-stop screening performed in a comfortable and convenient environment. Breast cancer takes patients down paths they never expected. For many, even getting an annual breast cancer screening can be an unsettling experience. That's why the GW Comprehensive Breast Center offers a comfortable, serene spa-like setting where women can receive a variety preventive, diagnostic and treatment services for breast cancer. When caught in early stages, breast cancer has nearly a 100% cure rate. The Mammovan travels to 160 sites throughout the DC region. Through our partners, The Mammovan brings live saving breast cancer screenings to approximately 2,500 women each year. 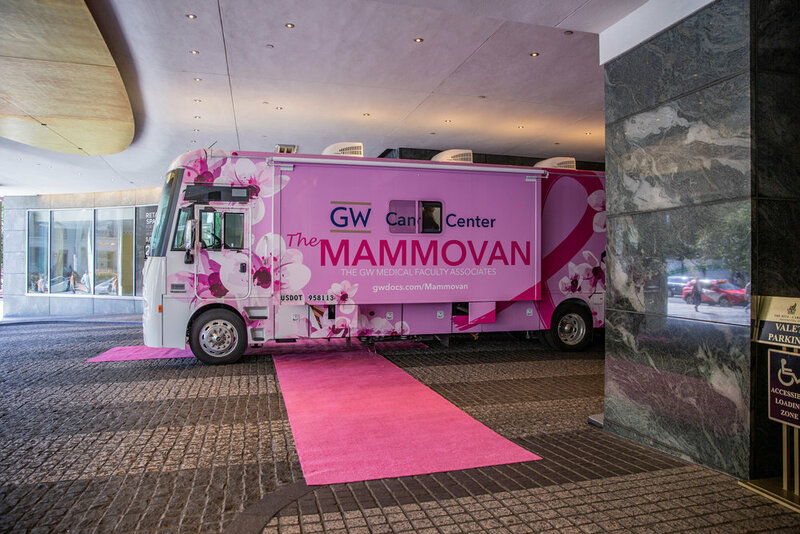 The Blush Lunch is the signature benefit supporting the Comprehensive Breast Care program of The GW Medical Faculty Associates and its mobile mammography unit better known as The Mammovan. The event has raised more than $1 million to deliver breast cancer screening to women around metropolitan Washington regardless of their ability to pay.